There are countless African American scientists, doctors, and inventors that have made strides in the area of science. Have students research these people. For a thorough list, check out The Faces of Science: African Americans in the Sciences. For younger children, check out books on their level or make a list. 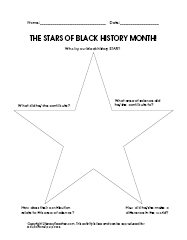 1) Who is your Black History STAR? 2) What did he/she contribute? 3) What area of science did he/she contribute to? 4) How does his/her contribution relate to this area of science? 5) How did he/she make a difference in the world? This is a FREE download. 2) What did he/she do? 3) How did he/she use science? 4) What kind of science tools do you think they used?